File photo of a person walking through Dublin. THE NUMBER OF homeless families and children staying in emergency accommodation declined last month, but the number of people in total shot up to record highs. Figures for January show that there were a total of 7,167 homeless adults and children in emergency accommodation across Ireland in January, up slightly from 7,148 in December. The overall number is up 25% on this month last year. There were some minor positives as the figures showed 33 fewer families living in emergency accommodation in January than December. 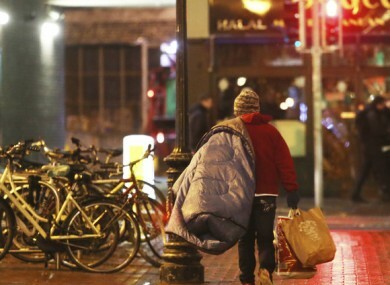 1,172 families in total were staying in emergency accommodation for a week in January. The number of homeless children also dropped by close to 100 across the country, with 2,407 staying in emergency accommodation in January. The number of homeless single adults went up, with 117 additional people in emergency accommodation than in December (4,760 in total). Dublin still has by far the largest number of homeless people, with 3247 homeless adults (not including rough sleepers) in January. Sinn Féin housing spokesperson Eoin Ó Broin welcomed the slight reduction in the numbers of homeless families and children, but said the drop was “clearly at the expense of single person households”. “The January homeless figures can be in no way labelled as a success and government policy on homelessness is clearly failing,” Ó Broin said. Homelessness charities Focus Ireland and the Peter McVerry Trust both voiced their concern about the rise in homeless adults. “Unfortunately, because of the difficulties single people face it is they who face the longest stay in homelessness,” said a spokesperson for the Peter McVerry Trust. Focus Ireland said that the number of homeless people had now reached a “record high” and criticised the Government’s “piecemeal” approach. “We need to maintain the huge public recognition that what is happening to these families is wrong, and the solutions that the Government have put in place are too piecemeal and too slow,” said Mike Allen, director of advocacy at Focus Ireland. Email “The number of homeless people in Ireland has reached a record high”. Feedback on “The number of homeless people in Ireland has reached a record high”.